1 - Letourneau VC-12 Tournatrain. Letourneau brochure. 2 - Letourneau Model VC-22 Sno-Freighter. LeTourneau brochure. 3 - Letourneau Side Dump Train. Pict from the book of Eric C Orleman : 'Letouneau Earthmovers’, MBI, Publising Company, 2001. 4 - Letourneau Logistical Cargo Carrier LCC-1. If there is a particularly prolific inventor, it is well Robert Gilmour LeTourneau. 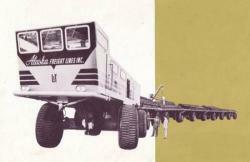 He conceived and directed among other huge and off-road land trains for transport to the desert or snowy lands. If we believe some newspapers of the time, the desert vessels were in tune with the time, but it was the only one to go through with his ideas by the full implementation of five land trains. 1 - The first was the VC-12 Tournatrain, comprising a power car and three trailers, 32 drive wheels with its own electric motor and 140 tons of payload. The Company made a demonstration on April 15, 1954 before the official of Tradcom of U.S. Army to convince them that these new land trains with multi-wheeled diesel-electric transmissions were the best way to transport equipment on snow. But it was never sold. At that time, the Cold War was in full swing and the U.S. government decided to install the DEW Line (Distant Early Warning Line), chain of radar in Northern Alaska (there were 78 sites) to give warning case of Soviet nuclear attack. 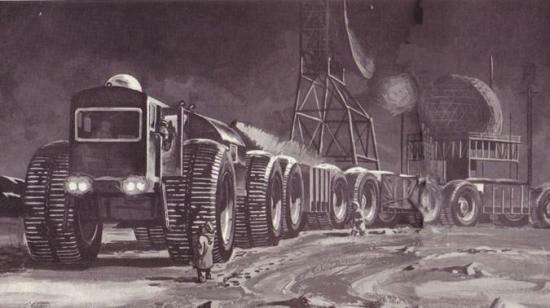 2 - The idea of a big off-road transporter was on his way and LeTourneau built in only six weeks Model VC-22 Sno-Freighter, 150 tons of payload, five drive trailers and a head car, based on all 24 drive wheels. Everything was provided for the life of a crew of four men. Alfred Ghezzi, already owner of a company, Alaska Freight Line Inc., composed of a fleet of trucks, planes and barges acquired the Sno-Freighter to rent his services to the U.S. Army for building the DEW Line. Al Ghezzi, a leading innovator throughout his life, took the gamble to move some freight by the Sno-Freighter on the Tundra and mountains when soil and rivers were frozen. Disassembled and shipped from Longview, Texas, by rail, sea and road, he arrived at Circle City in Alaska where it was assembled in 5 days and start operating in April 1955. While the monster was 'off-road', a road, sometimes mountainous, was opened in 39 days by a fleet of 5 Caterpillar D8 bulldozers, local guides in radio contact with an aircraft company demarcating the road. Another fleet drew the kitchens, dormitories and repair shops. Seven others bulldozers were used to widen the road and accompany the 32 Kenworth trucks and Sno-Freighter in difficult passages. The trip to sites of the DEW Line in Northern Alaska was about 800 miles and lasted for 3 months by - 50 ° C. It should enjoy the winter months to avoid stagnation. The second winter, in 1955-56, the starting point was moved to Eagle and the fleet of trucks and bulldozers reinforced. Unfortunately, the Sno-Freighter was seriously damaged 60 km away. In descending a slope, the engines worked as generators and fired the alternators. The driver, inexperienced, headed the train to the snow bank to try to slow down. He slowed the locomotive but the trailers, un-braked, pushed all and get across. 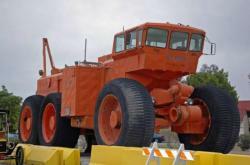 He became unusable and 170 tons of cement were left behind. Al Ghezzi went bankrupt and his company taken over by Anchorage Cold Storage and later by Sea-Land. 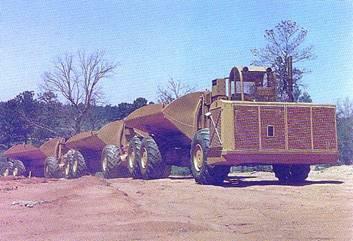 3 - In October 1955, LeTourneau revealed the existence of Side Dump Train of 18 wheels. Still it was not presented as an earthmoving vehicle because of the 5 years contract with Wabco prohibiting him to manufacture earthmoving equipment. Tested until 1956, it was never sold. 4 - In the middle of 1956, the U.S. Army received a second train known as the Logistical Cargo Carrier, LCC-1. Composed of a lead car and three trailers and 16 electrically all wheel drive, it had a payload of 45 tones. Lighter, lower the trailer for stability, it was used successfully to transport equipment to supply the DEW Line until 1961. 5 - Finally, the success of LCC-1 led to the construction of the 5th and last set of R. G. LeTourneau land train in 1962, Model TC-497 Overland Train MkII, the most monstrous of all, that they judge : it is the longest vehicle ever built 197 m long, turbines over 4500 hp, 54 electric powered wheels of 3.5 m, 10 trailers, 150 tons of cargo for 450 of total weight ; it was studied not only for snow land but also to the desert and sand, all for the price of $ 3.7 millions. Its autonomy was 600 km and its velocity of 32 km / h. Posted at Yuma Proving Ground, Yuma, Arizona for testing, it became outdated even before its commissioning. The aviation industry went into service in 1962 giant lifting helicopters that needed no roads, but much faster. The Vietnam War absorbed the credits and it was discovered too late that many trucks are better than one giant easily identifiable. But what happened to these monsters ? That is the question that everybody who loves beautiful machines may arise. The first train, the Tournatrain and the Side Dump Train surely have been scrapped because we have no more heard. But the Sno-Freighter, it, still exists. Purchased by Burgess Construction Co., the army decided in 1961 to return to Fairbanks for the repair and continue the evaluation of land trains. In May, a team of fine specialists of the Alaska-Canadian Freightways reached the crash site. The LCC-1 was the trip because its electrical system used, by connections, as replacement of burnt circuits of Sno-Freighter. The return lasted two months and was punctuated by delays and vicissitudes. 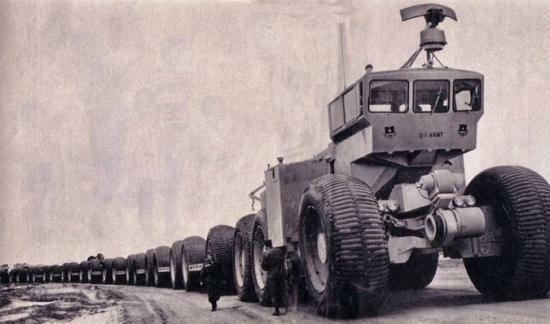 In 1968, Bobbie Miller bought the Sno-Freight for $ 25 000 then the next buyer, John Reeves, exhibited it to the tourists near Fox not far from Fairbanks at Pumping Station No. 13 on Steese Highway. 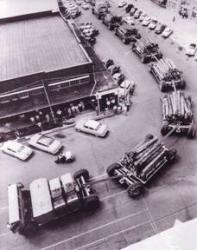 Regarding the LCC-1, it was decommissioned after this troubleshooting operation on July 5, 1961 and the lead car and two trailers can be seen currently in the court of Carl Pedersen on Badger Road near North Pole to ¼ of an hour from Fairbanks and a trailer to Cherokee Lodge in South Delta. We can always hope it will be saved as some public interests more and more these huge ancient monsters that are now part of the heritage. You can see sites: http://www.letu.edu/about_LU/museum/footprints/previous_entries.htm . The LCC-1 is now on display (outdoors) at Yukon Transportation Museum, Whitehorse, Canada, since May 2012 : http://www.advrider.com/forums/showthread.php?t=762086. The esate Of Carl Petersen hired a scrap dealer to clean the property after his passing at the age of 97 years old. the Land Train , was sold to a private person, somewere in Cannada to be restored and placed in a museum. thankfully it was saved. the . The tires were ten feet tall MR Taylor was in the midle of scraping it out .the rims were solid Aluminum they must haved wieghed 2,000 lbs each. Taylor scraped at least 25 rims . He said somone stoled them. to bad he erased so much history . It is in the Ginus book under the worlds Largest Land train. Taylor should be in Jail. I was stationed at Ft. Wainwright at Fairbanks, Alaska from 1988 until 1992 and remember seeing the LCC-1 just outside Badger Gate (rear gate to Ft. Wainwright) on Badger Road. I was in awe the first time I saw it, in fact everytime I saw it. Just never could've imagined anything like that. Sure would've been a blast to have been one of the crew. I'm glad to hear that it's still there and hasn't been scrapped yet. Hopefully it never will and will be preserved, I know if someone were to organize a restoration I would contribute to the cause as I would love to return someday with my family and would love for my kids to be able to see it, in fact it would be great to be able to climb aboard and look around at the restored unit.